Glasgow Housing Association claims it has a budget deficit of hundreds of millions of pounds which is preventing its move to local community ownership. BBC Scotland has seen a confidential report sent to the Scottish Executive which states that GHA alone cannot deal with the scale of the funding gap. 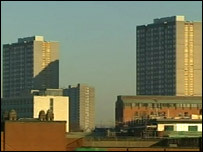 However, critics have accused GHA of failing its tenants. They said it has come up with another excuse to postpone the break-up of the association. The first stage of Glasgow's proposed housing revolution was the transfer of all council housing to GHA and the wiping out of a £1bn housing debt. The next stage involved a second stage transfer of GHA to local community organisations. However, the association said there was a hole in the transfer budget of £350m which was stalling the move to community ownership. GHA tenant chairperson Sandra Forsythe said: "The funding problem has arisen. We spoke about it months ago, we told the (Scottish) Executive, Communities Scotland and since then we've all been working hard on that." Critics have described this as a stalling tactic, delaying the GHA's break-up. Fraser Stewart, chief executive of Gorbals Housing Associations, said: "I think one of the main reasons it's appeared now is they're fundamentally finding the whole thing just too difficult and too awkward. "I don't really think they've got a deeply held belief that it will work. "I think that they have a professional executive team that would rather see a large organisation continuing to provide what they see as a professional service rather than give it out to community-based organisations like ourselves." However, GHA insisted it remained committed to community ownership and was working with the Scottish Executive to resolve its funding problems. Ms Forsythe said: "Everyone is agreed, second stage transfer will take place as soon as possible." Communities Minister Malcolm Chisholm said he was committed to improvements for tenants and driving community ownership. Speaking on BBC Radio's Good Morning Scotland programme, he said: "It's a complex process and this is the only transfer in the UK where there is to be a second-stage transfer to local organisations. It's something that's never been done before. "The paper highlighted today is part of an ongoing dialogue between the GHA and the executive. This is a top priority for me this year." The minister said he could not remember a specific date being given for second-stage transfer, but he expected a large number of transfers to take place over the next two years.